Shoes N Booze: Guest Post: Claudia Mora Reviews "From Stilettos to the Stock Exchange"
Guest Post: Claudia Mora Reviews "From Stilettos to the Stock Exchange"
Here at Shoes N Booze, we're all about women following their dreams and creating not only the businesses, but also the lives they desire. 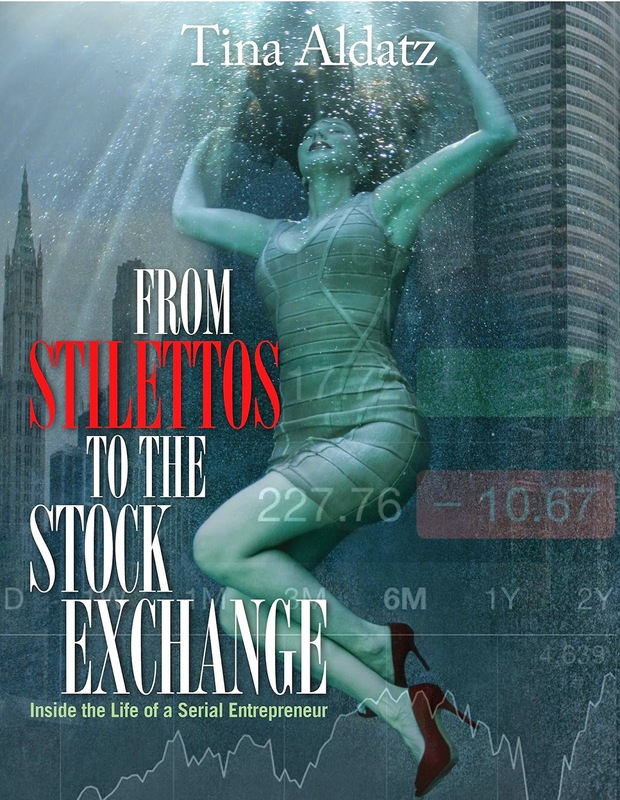 With that in mind, I invited one of my favorite serial entrepreneurs, Claudia Mora, to review a complimentary copy of Foot Petals founder, Tina Aldatz's new book, From Stilettos to the Stock Exchange: Inside the Life of a Serial Entrepreneur. Mora was hooked at first glance, so much so that she read it twice just to make sure she absorbed all the personal lessons and business tips possible. "Not only does Tina give us an in-depth, front row seat to the trials and tribulations she has endured in her personal life, she also gives us the big sister, business mentor, 'learn from my mistakes' inside scoop on how to start and run a business," says the pubilicist, salon owner and leader of the League of Extraordinary Latinas. Here are her top five takeaways from the 164-page tome. Never let your current situation dictate your future. — Tina Aldatz grew up with a law-breaking, drug-addicted father and an alcoholic mother who never seemed to stay in one place long enough to build stable friendships. Nonetheless, Tina turned her life around in a way most would think impossible. Throughout her journey to success one thing remained, her love and loyalty to her family. Never holding any grudges or resent for her parents' issues, she remained the rock for her family and still managed to navigate the journey to success. Ms. Aldatz said it best - "I cannot express enough how one must not be deterred by the hand life deals them, as even the most unpromising spread still has the potential of winning the game if it is played right." With hard work, dedication, determination and most importantly, self confidence, anything is possible. There really is always a silver lining. Find it. — At a young age, Tina was at the beach with her family. Playfully running after her aunt, Tina's feet sunk into the scorching sand and she ended up with third degree burns and was wheelchair bound for six months. Because of her resulting sensitive foot soles, Tina was a huge consumer of insoles for her shoes. She had a separate pair for each pair of heels she owned. One day, on a date, her insoles slipped out and her date exclaimed 'Ewwww'. Indeed, these insoles were tragic looking. That very night, Tina came up with the idea that would change her life forever and make her a millionaire... Foot Petals. You might not understand the reasoning behind some of the events in your life right away, but at some point along your journey, you realize why they happened. Bartering in Business is Smart Business. — Tina knew she was onto something big but lacked a budget and had already spent her start-up money on production, this is where she learned the art of bartering. Tina used her resources and relationships to barter the services she needed. A friend of hers was starting up her own boutique PR firm but didn't have a place to stay. Tina offered her a rent free living in return for PR for Foot Petals. She offered 5 percent of her company to her graphic designer in return for her services. Tina knew her company would be successful, so losing a bit in the beginning meant nothing to her. In business, you sometimes need to lose, to win. Tina always envisioned the bigger picture. Mother knows best... most of the time. — Tina's mother wasn't necessarily the best role model for a child to have, but one thing she did do was instill a certain confidence in Tina that would help her throughout her life. Her mother always made sure to tell her: "You are smart. You are pretty. You can do what others do, but better." Tina carried these words with her and truly believed them. She understood that confidence is key, and along with resilience and determination, nothing could (or did) get in the way of Tina accomplishing her goals. In business, a confident person controls the room, the confidence exudes from your person and you are automatically trusted. Tina's confidence in herself and her business saved Foot Petals from failing when she took a flight to Remington Corporation and secured a partnership with the production company. She said in the book, "I have exactly negative $332 to my name. I haven't been paid in six months. I have taken care of three family members, including my father. For the past three weeks, I've lived on beans, rice and tortillas. Sometimes tequila... There is nothing that I wouldn't do to make this company a success." Tequila - The Latina Entrepreneurs drink of choice. — The go-to celebration drink for Tina, and quite honestly, for myself is Tequila! Tina celebrated the "Grade A" Self Magazine review with Tequila, the partnership with Remington Corporation with Tequila and created a company culture with Tequila, she introduced Margarita Fridays to the Foot Petals team. It is truly important to celebrate your successes and the team that supports you toward them. Why not with Tequila?! From Stilettos to the Stock Exchange: Inside the Life of a Serial Entrepreneur was recently released by Apparel Insiders Publishing. Click HERE to purchase a copy. What's your favorite drink for celebrating successes? What's one main phrase your repeat to yourself during tough times?